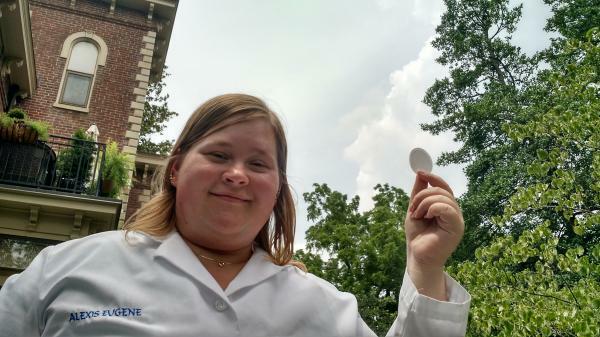 LEXINGTON, Ky. (July 15, 2016) — Alexis Eugene, a University of Kentucky doctoral student in the Department of Chemistry, has been awarded the NASA Earth and Space Science Fellowship. More than 700 applications were submitted for the 2016 awards, and Eugene was one of only 73 who received a fellowship in earth science. Eugene will collaborate with members of NASA's Langley Aerosol Research Group Experiment by analyzing the chemical composition of cloud water and aerosol samples collected during flights over the Atlantic Ocean. Specifically, she will study what chemicals are there and how they affect the properties of the atmosphere. "For example, looking at how those chemicals might interact with radiation," she said. Eugene has been working in Assistant Professor Marcelo Guzman's lab in the Department of Chemistry. During this time, she has garnered several national accomplishments, including the Graduate Student Award from the Environmental Chemistry Division of the American Chemical Society, and published work in the Proceedings of the National Academy of Sciences, Atmospheric Chemistry and Physics, and the Journal of Physical Chemistry A. The research supported by the fellowship will build on the recent work "Aqueous Photochemistry of Glyoxylic Acid," an article just published in The Journal of Physical Chemistry A by Eugene and Guzman. Eugene's research will contribute to NASA's North Atlantic Aerosols and Marine Ecosystems Study (NAAMES), which is investigating the processes controlling ocean system function, their influences on atmospheric aerosols and clouds, and their implications for climate.